A journey on a Kerala houseboat has been feted by the BBC (and many others) as one of the world's top ten journeys. Karma Kerala is one of the leading houseboat companies in Kerala offering everything from deluxe to standard boats. We have a wide range of cruises but if you want some advice, contact us and we will do everything we can do to help! We have tramped over the decks of 100s of boats inspecting cabins, kitchens and meeting staff. We assign ratings for each boat depending on age, design, hygiene, crew and general "ambiance". We try to match boats so that each customer gets what they want at the right price. These are guide figures as rates vary from season to season but it helps you get a sense of costs. Don't rely on them as they vary and the actual prices are per boat and not per person generally. You can translate these into your local currency to help you. Please note that actual rates are per boat but we have shown them as per person as it is easier to display. Rates vary from being most expensive in Xmas and New Year period and being the very cheapest in monsoon season and before - June to October roughly. You will see cheaper rates quoted on booking.com and the like. The cheapest rates there are for rooms on shared boats which we hate and dont offer for all manner of reasons. We have also studied their methods and realise that they are mostly agents and most of the boat images are inaccurate, but there you are! 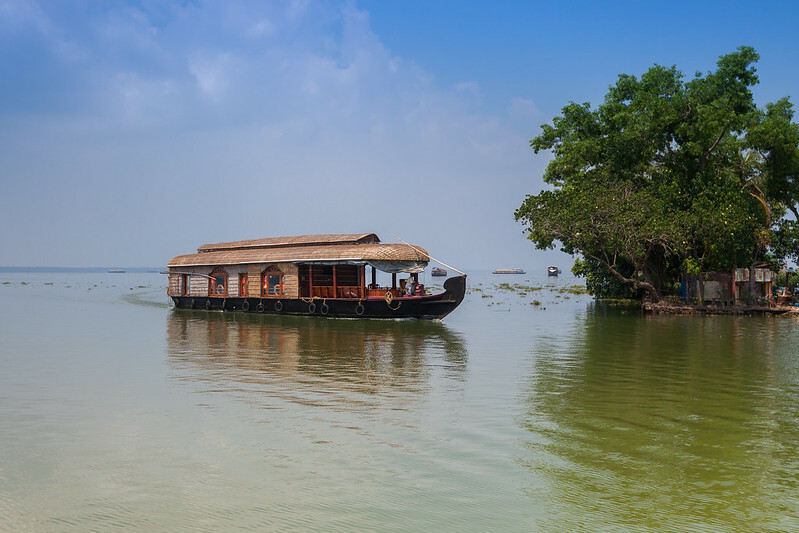 Kerala's Backwaters are a chain of brackish canals, lagoons and lakes running parallel to the Arabian Sea coast (historically known as the Malabar Coast) of Kerala in South West India. This network includes five large lakes linked by a series of canals, both man-made and natural, these in turn fed by some thirty eight rivers that drop down from the inland hills or Southern Ghats. 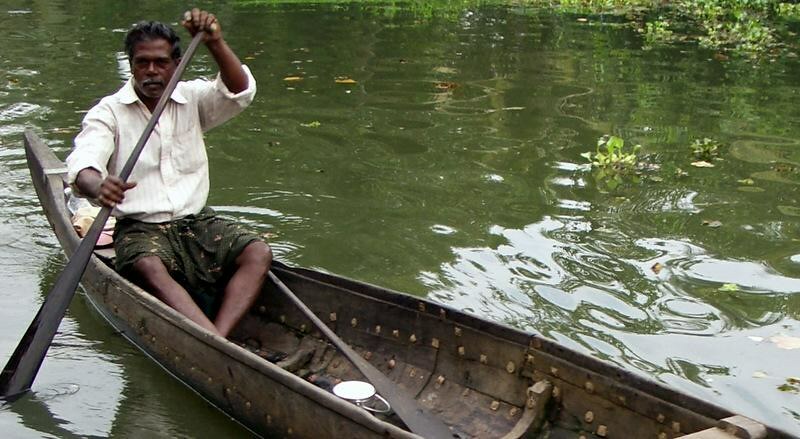 The backwaters extend almost half the length of Kerala although many are not navigable per se by riceboats. Ecologically, the backwaters were formed by the action of ocean waves and shore currents that created a series of low barrier islands across the mouths of the rivers flowing down from the Western Ghats range which formed a complete coastline comprised of low lying dunes anchored by trees and scrub. 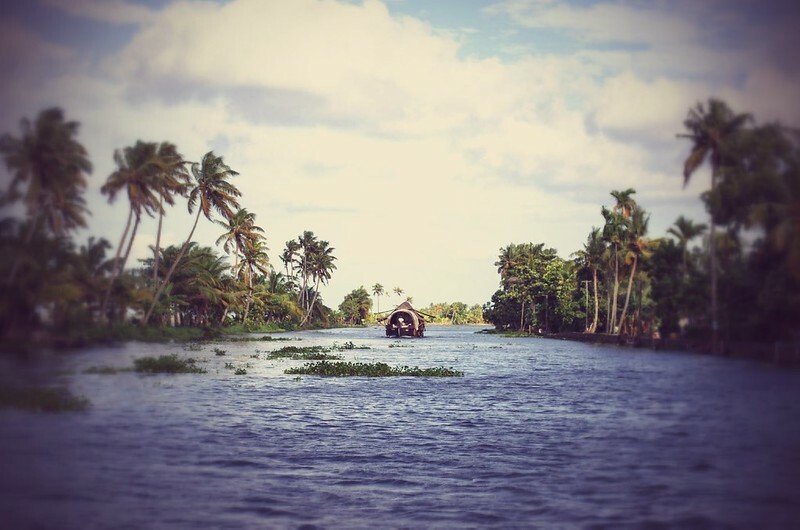 Kerala has over 900 km of interconnected waterways, rivers, lakes and inlets that make up the Kerala backwaters. In the midst of this beautiful landscape there are a number of towns and cities, which are the starting and end points of backwater cruises. National Waterway No. 3 from Kollam to Kottapuram, covers a distance of 205 km and runs almost parallel to the coast line of southern Kerala facilitating both cargo movement and backwater tourism. Vembanad Kayal is the largest of the lakes, covering an area of 200 km², and bordered by Alappuzha (Alleppey), Kottayam, and Ernakulam districts. The port of Kochi (Cochin) is located at the lake's outlet to the Arabian Sea. Alleppey, "Venice of the East", has a large network of canals that meander through the town. 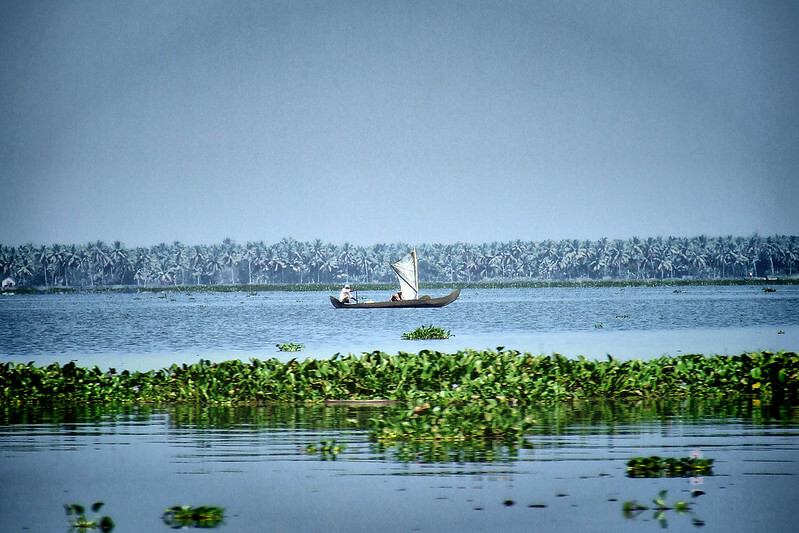 Vembanad is India’s longest lake. The traditional Kerala houseboats are huge, slow-moving, exotic barges now used only for tourist cruises. Keralan Rice Boats are simply a re-worked model of the Kettuvallams (in the Malayalam language, Kettu means "tied with ropes", and vallam means "boat"), which were used to carry the agricultural harvest such as rice and spices from the fertile rice growing paddy fields of the Kuttanad to the sea coast at Alleppey or Cochin. Kerala houseboats were considered the most convenient means of transportation in the absence of any meaningful roads. They have thatched roof covers over wooden hulls which protect the cargo from the sudden tropical rains of Kerala. Boats in a variety of shapes and sizes have traditionally been the main means of transport of men and materials in the Kerala Backwaters since olden days. In particular, the house boats were used to ship rice and spices and other goods between Kuttanad and the Cochin port. It was a three-day affair in those days. A standard house boat, which could be about 100 feet long, can hold up to 30 tons, and that is as much as three big lorries can. For the royalty these boats even became comfortable living quarters. It was the important mode of transportation in coastal Kerala just because of its accessibility to the most remote areas. It took the vision and enterpreneurship of a couple of enterprising young men to refurbish one of these leviathans, hoisting on to it a wooden super-structure incorporating a huge bed room, a toilet, a kitchenette and an open balcony. The ancient houseboat with a modernized interior became a hot favourite with tourists. A houseboat is about 60 to 70 feet (about 18 to 21 meters) long and about 15 feet (about 5 m) wide at the middle. The hull which is made of hundreds of fine but heavy-duty planks of jack-wood is held together absolutely by coir knots (not a single nail is used). This framework is then coated with a caustic black resin extracted from boiled cashew kernels. And it lasts for generations. The roof is made of bamboo poles and palm leaves. The exterior of the boat is painted with protective coats of cashew nut oil. The kettuvallam is motorised and is steered in deep waters by means of oars or a rudder. Long bamboo poles or 'punts' are used to propel in shadow areas. The crew of a kettuvallam comprises two oarsmen and a cook or chef. Fresh food, cooked in inimitable Kuttanadan style is the rage of the international tourists. Basically the kettuvallam was originally designed to transport cargo and as such many design changes had to be made to make it a tourist vehicle. The height of the roof was increased to get sufficient headroom. A plank was laid all through the length to reduce the disadvantages of the curved shape of the hull for walking and comfortable seating. Windows and other openings were provided for light, airflow and view. The entrance is provided in the centre of the linear axis with a top hung panel. More than 500 kettuvallams cruise the Kerala backwaters now, of which 100 are superior and maybe 10 to 15 are actually deluxe. Alappuzha is the main embarkation point for house boats with another significant jetty at Kumarakom. The house boats have most of the creature comforts of a standard hotel: well-furnished bedrooms, modern hygienic toilets, a well appointed living room, a beautiful kitchen and in some cases even a balcony for angling. A Kerala houseboat is on an average 70 feet long boats with 15 feet width in the central section. They are made from wooden planks that are stitched together by coconut ropes. Interestingly, nails are not used at all in the construction of the kettuvaloms. Most of the houseboats are made from a wood known by the name of Anjili. Palm leaves tied over bamboo poles form the roof of these houseboats. Cashew Nut oil is used as a varnish to ensure a protection for the houseboats. The hull is a series of wooden planks, long cut and carved, tied together using coir with coconut fibers stuffed in between.The hull which is made of hundreds of fine but heavy-duty planks of jack-wood is held together absolutely by coir knots (not a single nail is used). This framework is then coated with a caustic black resin extracted from boiled cashew kernels. And it lasts for generations.The kettuvallam is motorised and is steered in deep waters by means of oars. Long bamboo poles or 'punts' are used to propel in shallow areas. Bamboo beams sprouting off on the sides are used as foot holds for the same. Bamboo is used for the framework of the roof and splits of bamboo are used for weaving mat for roofing.